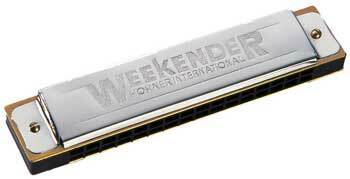 The Hohner Weekender is a tremolo harmonica. These harmonicas have a rich sound, but if you’re a beginner I recommend you get started with a standard 10-hole harmonica. 1. Higher Dollar (professional): My #1 pick is the Hohner Special 20. 2. Economy: If your a beginner who would rather get a more economical harmonica to “test the waters” (i.e. make sure you serious about sticking with harmonica before you invest), the Hohner Blues Band will get you off to a great start. A player would be hard pressed to find another tremolo harmonica of comparable quality with the Weekender’s affordable price! Has 24 double holes with plastic body. The double row of holes on Tremolo Harmonicas creates music with a distinctive vibrating (vibrato) effect. This is produced by the bottom row of holes and the top row of holes being played at the same time and tuned to the same note, with the top row tuned just slightly higher. This special tuning enables the player to make the tremolo sound which is especially popular for ballads, gospel and folk music. I LIKE THESE TREMOLO HARMONICAS VERY MUCH. THEY HAVE THE SOUND OF A 12 STRING GUITAR OR CAN BE SUBSTITUTED FOR A CAJON ACORDIAN. MOST PLAYERS DON’T REALIZE THAT YOU CAN PLAY TOP ROW OF NOTES JUST LIKE A 10 HOLE ONLY CHROMATIC. SINGLE NOTES WILL BEND AND OVERBLOW JUST LIKE YOUR SPECIAL 20 AND THEY ARE CHEAP ENOUGH TO BY ONE TO TRY. GET YOURSELF ONE AND GIVE IT A TRY.